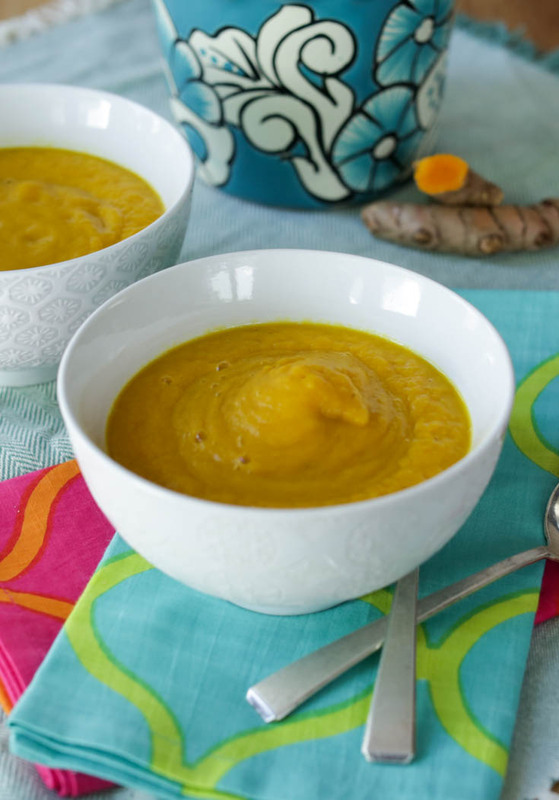 (You can leave the turmeric out of carrot turmeric soup and you’d be left with regular carrot soup, just like magic!) Really the only reason I added turmeric is because I had some fresh turmeric rhizomes. You ever do that? Find something unusual at your regular store and buy it before you know what to do with it? I do that ALL THE TIME. That habit of mine is why I end up with things like turmeric in my carrot soup. You should try it, too, and then we’ll be turmeric buddies! You might be tempted to increase the turmeric, given it’s many health benefits, but you might not be happy with the flavor. An approximately 2-inch length of fresh turmeric root is the max. Any more and the soup takes on a bit of a “dirt” flavor which impedes deliciousness. This soup is light and delightful and would be so good if you wanted to stir in a spoonful of this cilantro pesto at the end; or maybe try this coconut relish? Or make it easier on yourself and swirl in some plain yogurt. Or make it the easiest on yourself and just eat the damn soup. Chris and I will eat this whole pot of soup between us for dinner. It makes either two big bowls that are satisfying for an entire meal, or four small bowls that make a nice starter course. The nutrition info is for four small servings. Another nutrition note: I don’t peel my carrots. The vitamins in most vegetables and fruits are concentrated in the skin or just under it. Scrub them well with a soft brush and rinse! Saute the onion in the coconut oil until softened. Add remaining ingredients except broth and saute another 60 seconds. To cook in InstantPot: Saute onion in the InstantPot on saute function. Add remaining ingredients, cover and pressure cook over high heat for 5 minutes. Release pressure manually. To cook on stove: cover and boil 20-30 minutes until carrots are tender. You will need to check occasionally to be sure there is enough liquid in the pot. 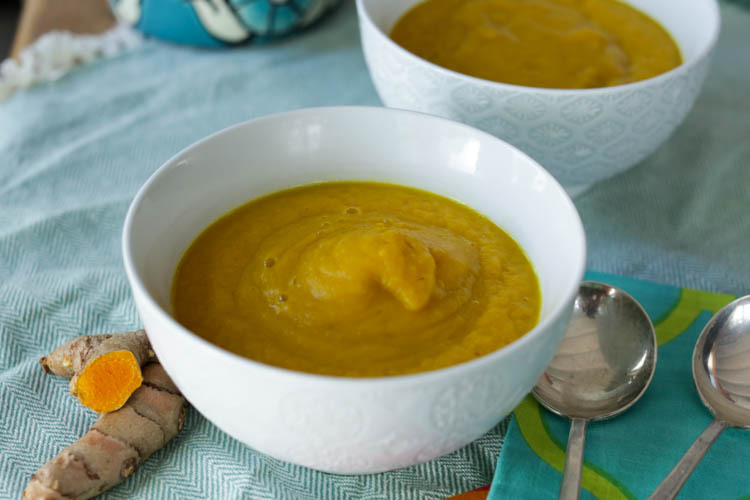 Puree soup with an immersion blender or standard blender, but be careful when blending hot liquids and hold the blender lid on tight with a dishtowel. Pressure building up in the jar can force the lid off and then you’ll have hot soup all over yourself and your kitchen.